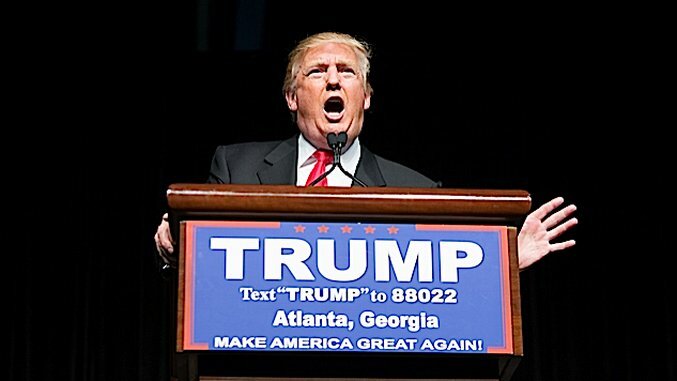 It is no secret that Donald Trump’s presidential bid has been struggling lately. Polling indicates that his support is waning, his fundraising efforts have fallen desperately short of where they need to be to sustain a national campaign, and he just fired his campaign manager. On top of that the coverage he has been getting in the media has been decidedly negative for weeks. If he wants a shot at the presidency, he has to adapt to salvage his campaign. That’s why we’re asking Bernie Sanders’ voters to join our movement: so together we can fix the system for ALL Americans. Importantly, this includes fixing all of our many disastrous trade deals. Because it’s not just the political system that’s rigged. It’s the whole economy. It’s rigged by big donors who want to keep down wages. It’s rigged by big businesses who want to leave our country, fire our workers, and sell their products back into the U.S. with absolutely no consequences for them. It’s rigged by bureaucrats who are trapping kids in failing schools. It’s rigged against you, the American people. Hillary Clinton has perfected the politics of personal profit and theft. She ran the State Department like her own personal hedge fund – doing favors for oppressive regimes, and many others, in exchange for cash. Then, when she left, she made $21.6 million giving speeches to Wall Street banks and other special interests – in less than 2 years – secret speeches that she does not want to reveal to the public. Together, she and Bill made $153 million giving speeches to lobbyists, CEOs, and foreign governments in the years since 2001. They totally own her, and that will never change. “The Donald” went on to cite passages from the controversial book “Clinton Cash” by Peter Schweitzer which has undergone several revisions, along with several findings of news organizations like ABC News that point to severe conflicts of interest for Clinton, as well as mistakes she made throughout her political career. While hyperbolic at times, Trump’s analysis of Clinton’s record is largely accurate. According to the International Business Times, arms sales while Clinton was Secretary of State increased dramatically for countries that donated to the Clinton Foundation — especially when compared with those to countries that did not donate. ABC just released a damning report about how a Clinton Foundation donor without any related experience, found himself on a sensitive government board dealing with nuclear strategy. Furthermore, though she officially stepped down from the board before her presidential bid, Hillary Clintonwould not answer whether Bill would give up his stake in the Clinton Foundation if she were elected president. She also did give speeches to special interest groups which she has refused to make public. Many of the foreign policy decisions Clinton has made throughout her career have been mistakes, like her support for the Iraq War. On top of all of that, she is currently breaking federal election laws — but so are many politicians in Washington. The list goes on. However, this piece is not meant to be a rehash of my previous articles. What is most interesting about Trump’s speech, at least to me, is what it revealed about this presidential race. Both presumptive major party candidates, Donald Trump and Hillary Clinton, are basically right about one another. They have both attacked each other’s temperament and judgment — and they’re both right. Whether it is Clinton’s political “hit list; or Trump’s apparent war on the First Amendment’s freedom of the press, calling for a lower standard to prove libel, or Clinton’s disastrous foreign policy blunders in Libya, Honduras, Syria, and of course Iraq, or Trump’s many failed business ventures, the presumptive presidential nominees are horribly flawed. Hillary Clinton has also called Donald Trump unfit to be president for his lack of policy chops. She’s not wrong. Trump’s speech hit many of the right notes in its diagnosis of our country’s ills — wrapped up with plenty of bigotry and xenophobia — but some of his solutions are all over the place. Much of what “The Donald” proposes are more of the same policies that put us in the situation we are in with our massive levels of inequality — like cutting taxes and walking back regulations on private enterprise. On the other hand, Trump also says he wants to reinvest in and build up our infrastructure, raise wages for American workers. We will build the greatest infrastructure on the planet earth – the roads and railways and airports of tomorrow. Our military will have the best technology and finest equipment – we will bring it back all the way. Massive new factories will come roaring into our country – breathing life and hope into our communities. Inner cities, which have been horribly abused by Hillary Clinton and the Democrat Party, will finally be rebuilt. Construction is what I know — nobody knows it better. The real wages for our workers have not been raised for 18 years — but these wages will start going up, along with the new jobs. Hillary’s massive taxation, regulation and open borders will destroy jobs and drive down wages for everyone. This ‘a little bit of everything’ approach is seemingly contradictory as austerity and opposition to “big government” do not go hand in hand with public works programs, and massive government overhaul. Given Trump’s overall vagueness when getting into policy details, it can safely be said that there is no way of actually knowing what the presumptive GOP nominee would do if elected. The policies he mentioned might not be those he would implement if elected. Much of what he says is probably campaign talk, but if taken at his word, the solutions he proposes suggest a detachment from reality. The implications of having two major party candidates like we have now are many, but all point to the need for a third party. A skewed process made Clinton the presumptive Democratic nominee, and a vocal minority of backlash voters made Trump the presumptive Republican nominee. Too many American voters were barred or discouraged from participating in both primaries. Our country faces historic levels of political and economic inequality, but neither of the apparent major party candidates are capable of making the necessary changes. Clinton is too much a part of the system, and Trump is too much of an outsider and a wild card — and even they know it.